An English camp for children, English Immersion Camp 2017, was held for the 17th year during the summer holidays. A total of 315 students in the third to sixth grades participated. This program helps children to deepen their understanding of the world, while spending days with camp leaders and staff from all over the world, communicating in English. In 2017, we held a workshop to learn in English about environmental preservation around the world, in collaboration with WWF Japan. Participants learned about global warming and forest destruction in Indonesia, and what we can do now to help the environment. WWF staff members, who load forest preservation activities in Sumatra and other places, gave quizzes on animal life and surveying methods, and the children actively commented and asked questions in English. At the end of session, they made eco-bags on their own, thinking about environmental issues. It is our hope to help children, bearers of the future, nurture their problem-solving ability by learning about issues occurring around the world and situations in other countries, and then think about them on their own. KIE organizes Kumon Instructors Conference annually for Instructors in Japan. In FY2017, the conference was held on March 4 at Kobe Portopia Hotel and Kobe International Exhibition Hall with about 2,800 participants. At that conference, we set up a display detailing the support that Kumon is providing to WWF Japan for reforestation efforts. The exhibit was aimed at deepening the understanding of Kumon staff and Instructors regarding the importance of forest preservation. Kumon Publishing published a book, Chasing Coffee Beans: Global Issues Observed in Tropical Forests in March 2018. In the tropical and subtropical zones, where coffee beans are grown, valuable tropical forests have been deforested for farm development. In recent years, inhabitants have been expelled for environmental protection reasons, and violence occurs in some areas. The author visited these tropical forests a number of times to observe the forests and study the lives of the people living there. He explains how we can see the world through coffee, based on his surveys and research. Since FY2013, the Kumon Group has been posting environmental reports on our website making information public about our environmental preservation activities and data (electricity usage, CO2 emissions, paper usage, and paper recycling), in addition to the Kumon Environmental Philosophy and Environmental Policy. The Kumon Group provides environmental education to all staff members in order to help raise their awareness and deepen their understanding of the environment. In FY2017 at training sessions for new management level staff and at other staff training sessions, e-learning was used to improve environmental awareness. Staff studied global environmental problems, environmental management and issues related to environmental regulations. Furthermore, by displaying posters and data about the environment in offices, each Group company has been successful in raising environmental awareness every year. We now provide more opportunities to learn about the environment and share information among staff members. Every quarter, the Kumon Group distributes the Kumon Green News Quarterly in Japanese and English to all Group companies. 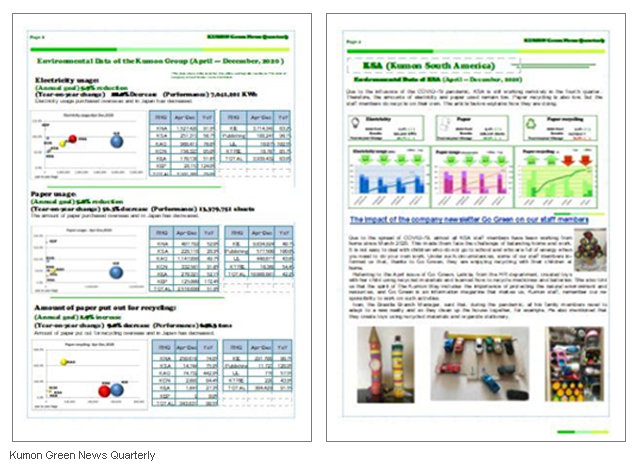 The newsletters include quarterly environmental data by region, as well as environmental activity reports sent from each Group company to be shared worldwide. In addition, each Group company promotes their own environmental communications, for example by delivering environmental news to staff members.